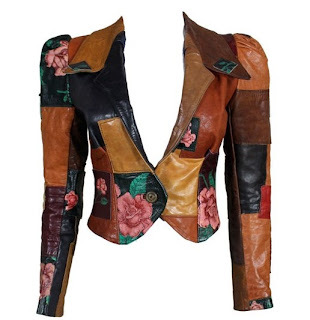 Recycled Fashion: Patchwork Leather Inspiration from ...Miley Cyrus! Patchwork Leather Inspiration from ...Miley Cyrus! Frequent readers of Recycled Fashion will know this is not blog that frequently follows celebrity style, unless there is a particular celebrity fashion inspiration to talk about. It feels a little bit wrong talking about an outfit worn by Miley Cyrus after today's media backlash against her but anyway..
Whilst browsing the weekend paper, I spot an outstanding frock recently worn by the controversial American performer and recording artist. A patchwork leather dress, in blocks of red, black and silver. It is a beautiful frock, modest in length with a flattering neckline. The dress is by Proenza Schouler, a New York based womenswear and accessories brand founded in 2002. Although this particular dress is not a recycled piece, it could be well be an inspiration to make a garment using bits and pieces of leftover or unwanted leather. For vegan's, or those that do not like the thought of working with or wearing real leather, artificial leather could be used as an alternative. I've personally never tried sewing with leather, although according to You SEW Girl, you can use an ordinary domestic sewing machine, you just need to make sure you have the appropriate leather sewing machine needles to use. 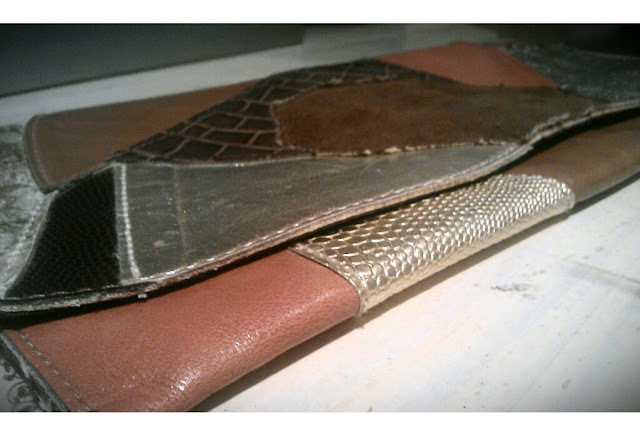 Co-incidentally, I found a second hand clutch bag in an Op Shop recently for a bargain price of $2. The bag is made from different pieces of leather and shiny artificial leather. With the right sewing equipment, I'm sure this would be easy to replicate? Martina Spetlova is known for using sustainable fish leather in her designs in a collaboration with Icelandic company Atlantic Leather. 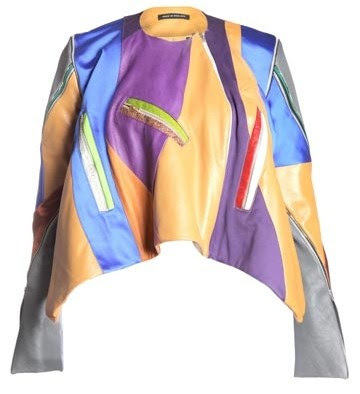 Readers, what are your thoughts on wearing patchwork leather (or patchwork artificial leather) clothing, do you like the look of it? 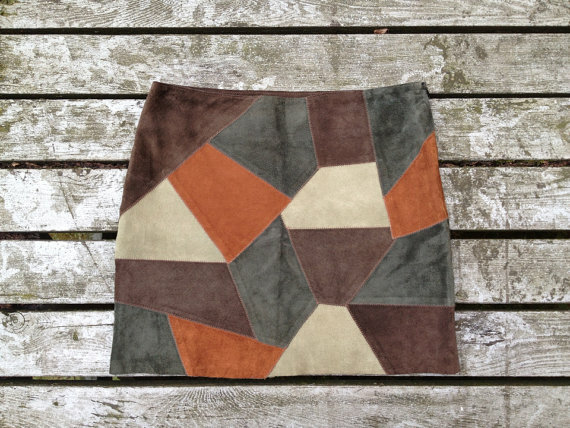 Are there any stitchers reading this blog post that have worked with leather before, and if so, do you find it an easy or difficult material to work with? 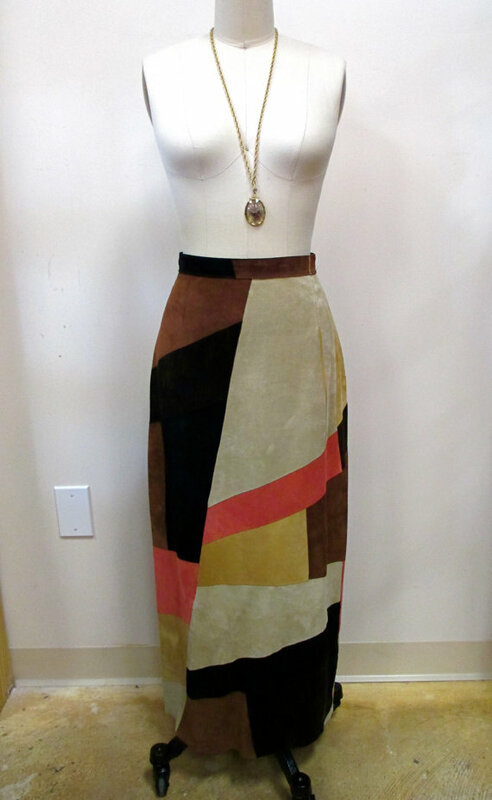 The 70's suede skirt is heaven! I'd wear that right now, even in 90 degrees : > Great round-up, Erica. This is an interesting 'genre' of clothing that is making a comeback. I had a vest like this in collage (70's) and my Mom had a skirt like these in her collage days,(40'). I love when trends come around again.